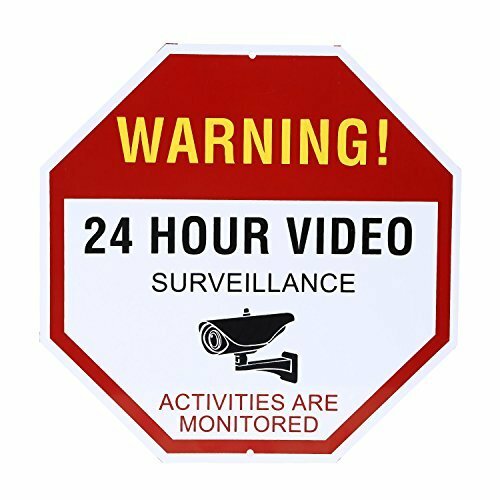 NONMON Video Surveillance Sign - Warning 24 Hour Security Alert 12'' X 12'' Octagon Aluminum Sign by NONMON at UCBC Group. MPN: OTD17101. Hurry! Limited time offer. Offer valid only while supplies last. Reflective ''Warning 24 Hour Surveillance'' Metal Sign. Protect your home & business premises DAY AND NIGHTMade with High Quality aluminum material. Made with High Quality aluminum material. Weatherproof and guaranteed never to fade or yellow. High visibility & contrast, enable viewers to read message from the furthest distances with the most impact. 12" x 12" octagon rust free aluminum plate, 24 hour video surveillance Sign is suitable for indoor or outdoor. Rustproof, waterproof and weather-resistant. All these no trespassing signs can withstand extremely bad weathers. Adopt the reflective material, it can glow at night when struck by the light. Every Video Surveillance Sign aluminum sign has 2 pre-drilled holes, Place it easily with no need of adhesive or special equipment. Ideal for Home, Garden, business, event venues, ski areas, parks and more. If you have any questions about this product by NONMON, contact us by completing and submitting the form below. If you are looking for a specif part number, please include it with your message.